After decades of dollar-hegemonic control, the world’s biggest oil buyer is finally getting its own crude-futures contract - the so-called 'petro-yuan' is born. The start of trading, open to foreigners, will mark the end of years of delays and setbacks since China’s first attempt at a domestic contract in 1993. Following December's final successful test, in a challenge to the world’s dollar-denominated oil benchmarks Brent and West Texas Intermediate, China will list local-currency crude futures in Shanghai on March 26, according to the nation’s securities regulator. While some details of the contract such as the size (1,000 barrels per lot) and grades have been released, other information like the delivery depots for the crude are yet to be announced. As Bloomberg reports, China surpassed the U.S. as the world’s biggest oil importer last year, buying about 8.43 million barrels a day to feed demand from government-run as well as independent refiners. The nation has also been hoarding millions of barrels for its Strategic Petroleum Reserve. Rather than buying how much ever crude they want, private companies have to adhere to government-issued quotas for their purchases. And this year such allocations expanded. “The ability for foreign producers and consumers to price hedging contracts on a domestic China commodities exchange using yuan is a game changer,” said John Browning, Shanghai-based managing partner at BANDS Financial Ltd., one of the brokerages approved for offshore trading on the contracts. “Apart from consumers and producers, for investors and commodity arbitragers, the Chinese commodity futures markets are deep pools of liquidity that international traders have been clamouring for access for many years,” Browning said. While international investors may prove circumspect, there’s little doubt the Chinese will embrace their own oil futures enthusiastically. Bloomberg finally points out that international commodity trading houses such as Mercuria Energy Group, Vitol Group and Glencore could potentially use the futures for trading arbitrage and hedging, according to Chen Tong, an oil analyst with Tianjin-based First Futures Co. The contract may also be attractive for financial institutions such as investment banks and funds, he said before the announcement. If the futures are embraced by overseas investors and become a benchmark for global oil transactions, China’s hoping the yuan could challenge the dominance of the greenback in international trade. As The South China Morning Post reports, the trading start in late March echoed earlier market speculation that the crude contract would not receive a go-ahead until the end of the annual session of the National People's Congress, which starts on March 5. "It will be just a baby step ­towards gaining pricing power in crude oil," said Wang Feng, the chairman of Shanghai-based financial services firm Ye Lang Capital. "A high turnover will not [necessarily] translate into a real pricing benchmark." Huang added: "Globalisation is a long, long process ... The Shanghai crude contract is just providing a yuan-denominated hedging tool for domestic oil companies and consumers. It will take several years before the ­contract becomes a regional benchmark." Still, as Bloomberg reports, skeptics say that won’t happen as long as the currency is controlled by the central government, and while international traders may agree to settle contracts converted into yuan, they’ll continue to price the oil in dollars. “This is a first small step toward China becoming a more active price setter in oil, but for Shanghai to come anything close to a global benchmark, it will take years,” Michal Meidan, an analyst at industry consultant Energy Aspects Ltd., said before the announcement. Additionally, OilPrice.com's Irina Slav notes that analysts interviewed by Bloomberg’s Sungwoo Park note that the dollar has been the currency that oil trade is done in for decades — and old habits die hard. But it’s not just about habit; it’s also about transparency. Beijing has been open about its intentions to make the yuan an international currency, but the government’s grip on capital flows from and into the country is unlikely to woo foreign investors despite efforts that China is making to assure them its financial markets are transparent and free. In the long run, it would make sense for many oil trades to be carried out in the currency of the top importer. 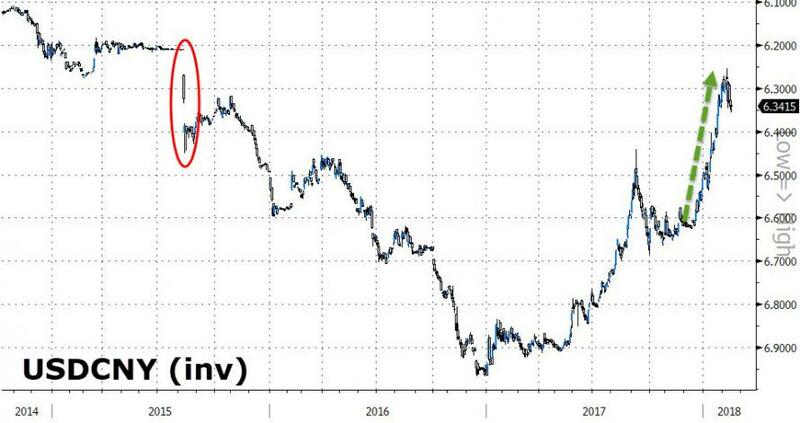 But it would take years for the yuan to undermine the dollar as the ultimate petrocurrency and it would also involve risks, some observers familiar with Robert Triffin’s Dilemma have noted. China seems to want the yuan to become the new international reserve currency. But, as goes the dilemma, this would mean that China would have to transform from a major exporter to an importer, which would strengthen the currency but necessitate it to generate a trade deficit. The reason the U.S. dollar became the global reserve currency was the country’s ever-growing trade deficit, said Triffin back in the 1950s, and it is the reason it is still maintaining this position. An unavoidable consequence of an international yuan would be the lower competitiveness of locally produced, export-bound goods, which is hardly something Beijing wants to happen, at least in the short term. Yet it is very unlikely that President Xi is only thinking about the short term. The Belt and Road initiative is a long-term comprehensive plan to expand China’s presence in the world and its clout across industries. Yes, it would take years for the yuan to replace the greenback as the petrocurrency the world uses. And it better take years — a lot of them — so the local industries have time to adjust. China is already moving from heavy industries to services. Now it will have to accelerate and expand this process. But skeptics say this won’t save it from falling into the trap of the Triffin Dilemma. Well, it wouldn’t — but judging by the American economy’s growth, despite the 2017 trade deficit that hit the highest since 2008, the trap may not be too uncomfortable to sit in. But, as we detailed previously, some see the writing is on the wall for dollar hegemony, and we suspect the decline in global yuan trade volumes is another reason for China to push ahead sooner. And now it just became one step closer to reality, which, according to Adam Levinson, of hedge fund manager Graticule Asset Management Asia, will be a “wake up call” for investors who haven’t paid attention to the plans. Is this end of the petro-dollar in the Mideast? Actually, yes. But the Yuan has nothing to do with it. If the US no longer runs trade deficits with the Mideast, they no longer need to accumulate US dollar reserves. China is now the biggest importer of crude in the world. If China starts running perpetual trade deficits with OPEC countries, it makes sense for OPEC to hold Yuan reserves as long as the OPEC countries trust the yuan.